Congratulations to the tour winner, Rita W., and to the host winners, Laura's Interests and Fabulous and Brunette. 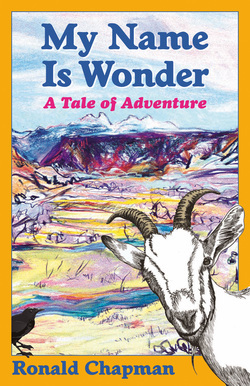 Goddess Fish Promotions is organizing a Virtual REVIEW ONLY Tour for My Name is Wonder by Ronald Chapman, a 156 page spiritual self-help book available September 1, 2016 from Terra Nova Books. The tour will run every Tuesday for 4 weeks starting on October 25, 2016, and the book is available in PDF format. Ronald will be awarding a $10 Amazon or B/N GC to a randomly drawn winner via rafflecopter during the tour, and a $25 Amazon or B/N GC to a randomly drawn host. Additionally, Goddess Fish Productions will be awarding a $5 Amazon GC to a randomly drawn host. I would like to host/review on 11/08 on Fabulous and Brunette - thanks!! The Reading Addict can host 11/1. Thank you. Unabridged Andra's can host. Any day. Would love to help out. Any day will work. @ Books,Dreams,Life. Thanks! I can host and review on Sharing Links and Wisdom on November 15.